Locating buried treasure in Vermont is possible. There are stories that have been in existence for many years about different kinds of treasures scattered throughout the state. I have listed a few of them below. Can you find one? Yes you can. Others have located buried caches and hidden treasures in many states. Some of them were found by accident, and others were located because of the research that was put into the search. Good research is the key to locating any treasure. I’ll give you examples of what is needed in the way of research. The effort you put into the research is up to you. The easiest place to start your research for buried treasure is in your local library. Take the information I have given you and research it further. Never rely solely on a single story about a hidden treasure. Some stories are myth, and many others have been changed throughout the years. The local historical society of the area you are searching in is another good place to look for information. You would be surprised at how much information they hold. Old newspapers, post cards, and books are just a few of the items that these societies have that can help you with your research. And always be looking for other ideas or treasure leads when you are searching for information on your search. 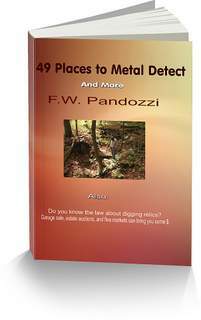 If you don’t have a metal detector, and you want to search for buried treasure in Vermont, then you should purchase one. Metal detectors make searching for treasure much easier. You do not have to spend a lot of money on a detector. New models can be expensive, but for approximately $250 you can purchase a decent detector that will be more than efficient. I’ve used just about every manufacturers detector and I keep coming back to the Garrett. In case your interested, visit my Garrett page. Here are four places that have stories about hidden treasures in Vermont. Fort Dummer on the Connecticut River was a Revolutionary War fort. Rumors of small caches of gold and silver coins hidden there have circulated for years. Harmon Hill has a story about British soldiers of the Revolutionary War burying several kegs of silver coins after the battle and defeat at Saratoga. Harmon Hill is located approximately five miles southeast of Bennington. Pirate treasure may be buried in or near Money Cave in the Green Mountains. The St. Francis Treasure supposedly consists of approximately $40,000 in gold and silver coins, along with church plate. It was buried on the west shore of the Connecticut River near Bloomfield, county rte 105, Essex County. You need to understand the laws about digging buried treasure in Vermont. If you are searching on private property always ask for permission. If you plan on searching on state lands, you need to know the state laws. You can visit this page about the Vermont State laws. Buried treasure in Vermont may be located in these areas. And good luck in your search for Vermont treasure.